Whether you care for children or have a full-time job, it is often hard to find time to maintain your yard in today's busy world. There are several simple ways of saving time and energy while creating a beautiful garden for your home. Here are a few easy tips that will help your create a no-fuss garden that is easy to maintain. Choosing the right plants is one of the easiest paths to hassle-free gardening. It is important to understand your lawn or garden's growing conditions to be able to choose plants that will flourish. Planting varieties that you know will thrive will reduce stress caused by trying to keep plants alive (in vain). Using plants that are found in your area will guarantee success. Plants that are easy to care in most conditions are daylilies. These flowers are largely free of pests and thrive in even hot and sunny areas of your yard. Planting perennials also keeps hassle to a minimum since you avoid having to plant each year. Designing a simple garden will save you time and effort in maintaining it in the future. Avoid planting too many varieties, especially if you have a small space. 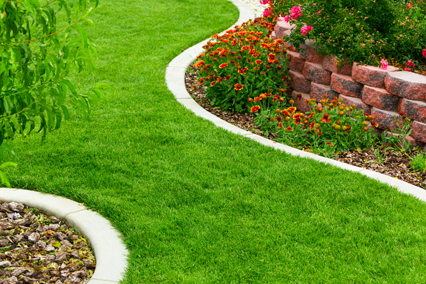 There are also several ways to use hard landscaping like pavers to reduce the amount of grass on your lawn. Surrounding your flower beds with an edge also helps reduce maintenance. They stop grass from growing into your beds while providing an attractive barrier between your garden and lawn. Popular materials for edges include brick, wood and plastic. The edge should be deep enough to prevent grass roots from extending into the bed (around six inches). Using a flat edge will make mowing the lawn easier since you can run it over the edging. Alternatively, used raised beds for flowers and other plants. If you need help planning your garden talk to a garden design professional. Adding a layer of mulch is a good way to reduce ongoing garden maintenance. You should spread between one and two inches of mulch over the garden. The mulch will help prevent weed growth, one of several benefits of using this organic material. Mulch also keeps plants healthy by retaining moisture, even on hot and dry days. As the mulch decomposes, it will also provide nutrients for your plants to thrive and grow. Weeds can become a problem with any yard. The best way to control weeds is to remove them while they are still young. Smaller weeds are easier to pull out. You can also use herbicide to kill weeds as you notice them. Getting weeds out early reduces the chances that they will reproduce. A small pressure sprayer is great for isolating weeds and destroying them where they pop up. Using herbicide at the start of the season on your grass will also help kill weeds and minimize the work you need to do to remove them during the summer. Also, avoiding cutting your grass too short will also help prevent weed growth. Watering is vital for keeping your garden stunning, but doing it right will reduce the amount of time and effort that goes into maintaining your garden. During hot days, water your lawn and garden during the early morning. This will reduce the amount of evaporation. Watering too late in the day, particularly in the evening, also means that there may be too much moisture on your lawn and garden. This could lead to fungal growth that damages plants. One of the simplest ways of making gardening easier is using the right tools. Whatever tool you use, make sure that the tool is right for the job at hand. You should always make sure that blades are sharp. Having a sharp pruner, for example, will avoid damage that could potentially kill a plant or tree. A soaker hose is another great tool. It saves time and energy, and it also maximizes water use. The soaker is permeable and allows water to seep slowly along the length of the hose. You can also use a timer to automatically turn on the water. A drip-irrigation system is another great tool for watering pots and other plant containers. This easy-to-install device automatically waters your plants, making your even life easier.